Mazda 6 Forums : Mazda 6 Forum / Mazda Atenza Forum > General > Other Mazdas > Now the Yaris hatchback is going to be a Mazda! Now the Yaris hatchback is going to be a Mazda! This is actually really cool in my book. bluedevil6 and Pangolinrider like this. Funny how Mazda doesn't think the Mazda 2 would sell in the US but they will co-brand it with Toyota and it will sell. That's the beauty -- Mazda doesn't have to actually get it into driveways, Toyota does. Toyota pays Mazda X dollars and Mazda makes X cars. The general public doesn't know anything about Mazdas but they might say, "oh, that new little Toyota is cute." A Mazda 2 might not move any units, but a Toyota Mazda 2 can do just fine. Hopefully. A Mazda 2 might not move any units, but a Toyota Mazda 2 can do just fine. Hopefully. Out here in Phoenix I see plenty of the existing iA/Yaris iA/Yaris/really-a-Mazda-2 sedans on the road. I think offering the Mazda 2/Yaris Hatchback should sell well. That's awesome! 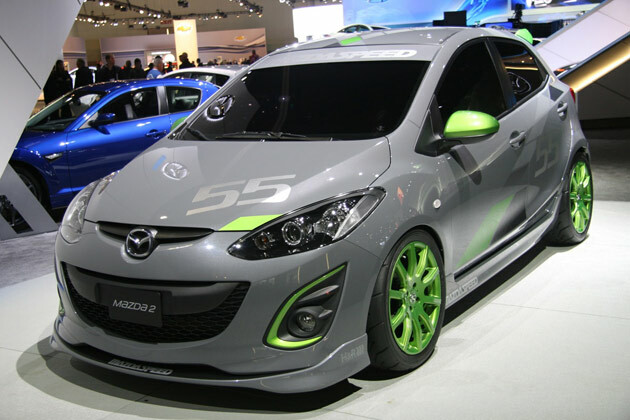 I love Mazda2s. I drove a Yaris as a rental and if I were in the market for a very small car, I'd definitely get it as a Mazda. I dislike Toyota styling and hate their logo, it looks like a cowboy hat (the hats are fine, no hate, just not on cars). A couple blocks over a neighbor has a Mazda2 and it makes me smile whenever I drive past it it. It's so cute, like a baby Mazda. Oh God, that's so goofy, but I can't help it, that's what I think when I see them. I hope you don't mind if I'll borrow this picture and a few of your words to be posted in our local forum. DrFeelGood and MazdaMetalhead like this. I personally would love to see something along these lines...without the green of course. How about 2.0 turbo with AWD. That's pretty slick looking. I almost like the green in the format of a special edition. I think it does look pretty slick but would you drive it every day?